Israel-Gaza Peace March from The Daily Gazette on Vimeo. Students for Peace and Justice in Palestine (SPJP) and J Street marched together yesterday in a show of solidarity with those affected by the heightening violence in Gaza and Southern Israel. The groups hope that this will be the first of many combined efforts to raise awareness about the conflict on campus. Danny Hirschel-Burns ‘14, an active member of SPJP, and Jacob Adenbaum ‘14, one of the co-leaders of J Street, organized the march in support of non-violent resolution between Palestine and Israel. 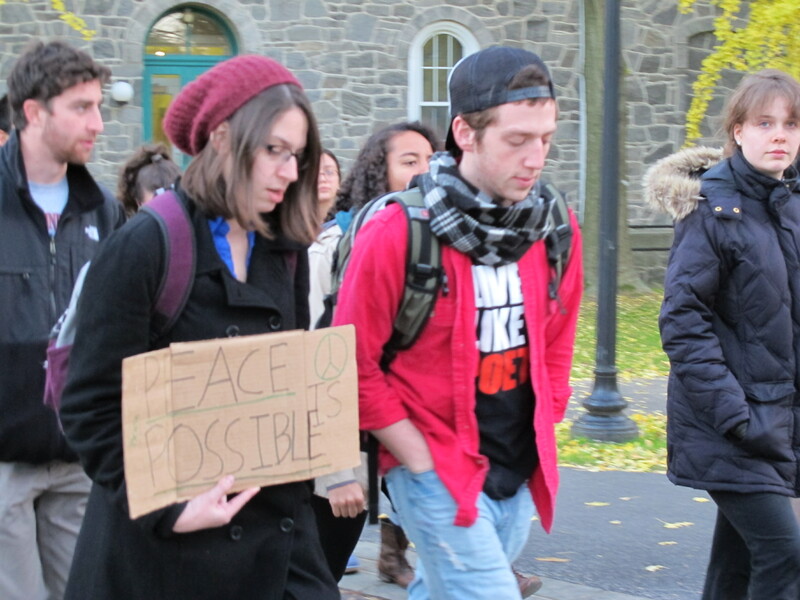 Approximately 45 students showed up for sign-making and a march that began and ended on the steps of Parrish Hall. “Both groups have people with family members in the area. This war is not in anybody’s interest,” said Herschel-Burns. “We’ve always wanted to work with SPJP,” said Caleb Jones ‘14, co-leader of J Street, which was started earlier this year. The group is politically-focused, whereas SPJP focuses on humanitarian work. The march drew many students without an affiliation to either group. Sadie Rittman ’16 and Leonie Cohen ‘16 joined in to express their support of a peaceful resolution. “I’m just a proponent of peace and nonviolence. . .I want to show solidarity for people who are on both sides of the conflict,” said Rittman. Cohen, who has family in Israel, decided to march for similar reasons. “Both sides are scared and both sides have people that are being killed,” she said. 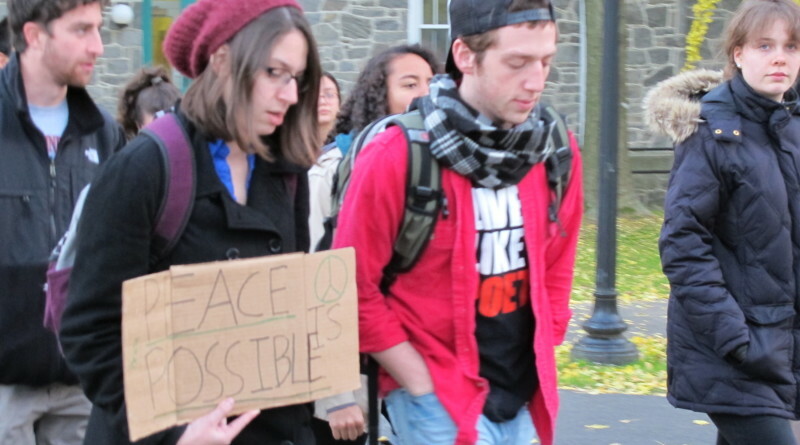 As they marched, participants carried signs with slogans such as “Peace is Possible” and “We all must compromise.” From the moment of silence that began the event, to the loop around campus, all participants put their individual agendas aside to promote resolution. “I’d like to see this issue more broadly on people’s minds,” said Razi Shaban ’16, a member of SPJP. He says that on campus, people don’t pay much attention to what’s going on in the rest of the world. Adenbaum, who along with Hirschel-Burns, read a statement of solidarity before the march, said he hopes that “collaborations [between the groups] will be numerous and fruitful,” and that both groups can work together to engage the campus community in conversations about the conflict.